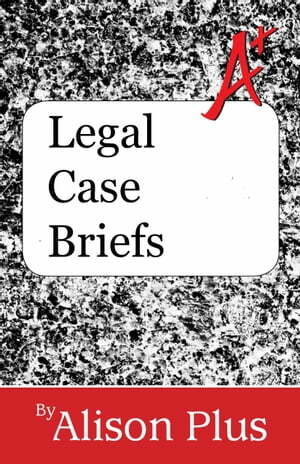 Collins Booksellers - A+ Guide to Legal Case Briefs by Alison Plus, 1230001029260. Buy this book online. You must write a legal case brief, either for school or for internal use in a law firm or other legal setting. However, even though you have seen other case briefs, you are not sure how to brief a case. Maybe you have never written a brief like this before and do not know what it should look like. Maybe you have written a document like this in the past, but you were unhappy with the product and you want to do better this time. Maybe, no matter your skills and experiences, you are just looking for extra help so that this kind of document will be easier to complete. This booklet can help you by showing you the complete process of briefing a case. This practical, systematic method will start with a basic discussion of the purpose of case briefs and end with a final proofreading. In between that first and last step, you will learn how to write each section of a case brief, section by section. These sectional breakdowns show you exactly what to include in different places within the brief. You will no longer need to guess what to write and where to write it. By using the breakdown, the various pieces of the document will work together to create a coherent and complete brief. This booklet not only helps you brief a case, but it shows you a critical thinking process important to the practice of law. Working the sections carefully the first time will teach you the method. Then, when you must brief another case, use this booklet as a reference to help you remember what each section must include. The more you use the method, the easier it will be.